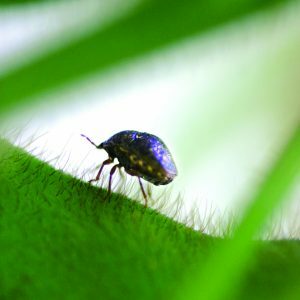 (ANNAPOLIS, MARYLAND) – June 1, 2017 – Kudzu bug, an invasive insect, has been identified in nine Maryland counties and growers should be vigilant, according to the Maryland Department of Agriculture. Kudzu bug, originally from Asia, has been found in Anne Arundel, Calvert, Carroll, Charles, Dorchester, Montgomery, Prince George’s, St. Mary’s, and Talbot counties, the department said. Soybean growers are advised to scout for the pest, which can reduce yields, but can be controlled with appropriate pesticides. Kudzu bug is about the size of a pea and a distinctive olive green with brown speckles. It is broad and flat across the back end. Kudzu bug is a “true bugs” with piercing-sucking mouthparts. According to the department, kudzu bug typically feeds on kudzu vines and then may migrate to soybeans and other types of available beans. Excessive kudzu bug feeding can reduce soybean yields by reducing pods per plant, reducing beans per pod, and/or reducing seed size. In Maryland, the pests have mostly been collected on kudzu, however, some have been found on soybeans in Dorchester County this spring. To report a sighting or collected sample of kudzu bugs, contact the department’s Plant Protection and Weed Management section at 410-841-5920.